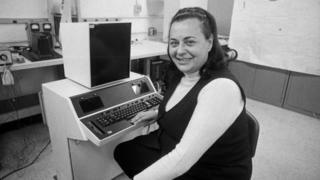 The woman who created and sold what many recognise as the world's first word processor has died aged 93. She grew Redactron from nine employees to close to 500 and was named one of the US's top leaders by BusinessWeek magazine in the year she sold it, 1976. She had earlier built one of the original computerised airline reservation systems. The innovation - which matched customers and available seats - was tested by United Airlines in 1962. According to the Computer History Museum, it had a one-second response time and worked for 11 years without any central system failures. The technology vied with the rival Sabre system, developed by American Airlines, for being the first of its kind. In an interview in 2015, Ms Berezin explained that she had decided to set up her own business in the mid-60s after coming to the conclusion that her prospects were limited so long as she was employed by someone else. She said that she had initially considered developing an electronic cash register but ultimately opted to create what would become known as a word processor instead. She said: "6% of all the people in the United States who worked were secretaries. "At the time we started, which was in 1968 to 1969, nobody really had any desk-type computers on which you could write a word-processing program that a secretary would use. "I know that desktop computers seem obvious now but it wasn't so then." At the time, the nearest equivalent was a machine by IBM called the MT/ST - a typewriter with magnetic tape recording and playback facilities. IBM's marketing referred to a "word processor", but the machine relied on relay switches rather than computer chips, had been targeted at military equipment makers rather than the wider business market, and in Ms Berezin's mind was "klutzy". "We were committed to building a computer to run our system and we knew that we had to use integrated circuits because it was the only way we could make it small enough and cheap enough and reliable enough to sell," Ms Berezin said. Her machine - which stood about 1m (3ft 3in) tall - featured a keyboard, cassette drives, control electronics and a printer. It could record and play back what the user had typed, allowing it to be edited or reprinted. The original model lacked a monitor, and soon faced competition from a rival, the Lexitron, which did. But later versions of the Data Secretary did include a screen. The project nearly ended in disaster. Ms Berezin had intended to buy the processors required from Intel, which had gone into business in 1968. But it said it was too busy dealing with orders for its memory chips. The solution was that Redactron had to design some of the chips required itself and provide the schematics to two manufacturers. "To our horror it was a dry day and the engineers were setting this non-working machine up for our big story," Ms Berezin said. "Ed Wolf [our head of engineering brought] a full pail of water and without a word to anyone throws the pail of water over the whole thick carpet in the room. "The water sank into the carpet, which stayed damp for three or four hours, and the machine worked perfectly." The first production machine was delivered to a customer in September 1971. And over the following year, Redactron sold or rented more than 770 others, excluding demo units. Over the following years, demand grew but the company's finances came under strain, in part because of high interest rates and a recession that meant clients wanted to rent rather than buy its products. "We were told by the bank to sell the company and they had somebody they knew who was interested," said Ms Berezin. "At the time, I was distraught about it." She went to work for the purchaser, the business equipment-maker Burroughs Corporation. But it proved to be an ill match. "I was not one of them - I told them what I thought - a loud woman they did not know how to deal with," she said. "So, they disconnected and so did I." Ms Berezin left the company around 1980, after which she became involved in venture capital and sat on other companies' boards before becoming involved with Stony Brook University. The New York Times reported that a nephew had confirmed she had died on 8 December in Manhattan after turning down treatment for cancer. One of the remaining Data Secretary word processors can be seen on display at the Computer History Museum in California.